Dairon Blanco's first home run at the Double-A level was not only a grand slam, it was the pivotal swing as the RockHounds defeated the Sod Poodles, 11-5, at HODGETOWN in Amarillo. The win gave the 'Hounds a 2-1 series victory and a split of six games on their season-opening road trip. Brallan Perez' RBI single broke a scoreless tie in the top of the third against San Diego Padres prospect Adrian Morejon. The 20-year-old left-hander then hit Nate Mondou with an 0-2 pitch and walked Mikey White to load the bases. One batter later, Blanco ripped a line drive to the grass berm in deep right-center. The grand slam gave the 'Hounds a 5-0 lead that would, for all intents and purposes, be the difference in the game. The 'Hounds added a pair of unearned runs in the eighth and four more in the ninth, three of them on Collin Theroux's monster home run to right-center, pushing the lead to 11-1 (Buddy Reed homered for Amarillo in the eighth). The Sod Poodles rallied with four in the ninth to make the final 11-5. Brian Howard earned the win and recorded his second consecutive outstanding start. After limiting Frisco to one run in five innings on April 5, the 6-9 right-hander shut out Amarillo over five frames, allowing just four hits and one walk while striking out two. He is now 1-0, with a 0.90 ERA through two starts. 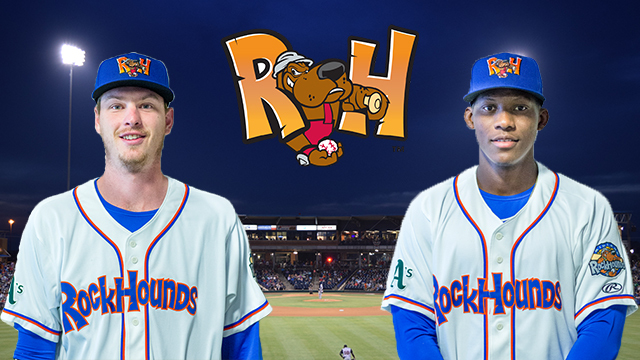 The RockHounds were out-hit, 12-8, but took advantage of almost every scoring chance, and scored seven runs on two swings (Blanco's slam and Theroux's three-run, shot). The 'Hounds completed their season-opening road trip with a 3-3 record (the 'Hounds lead Frisco, 4-1, in the top of the 11th in a game suspended due to rain last Sunday in the Metroplex). They will now host the same two clubs they faced on the road swing … Frisco and Amarillo … beginning Thursday night at Security Bank Ballpark. Wednesday's game was played in winds gusting to near 40 miles-per-hour (and blowing out to right field). Dairon Blanco finished 2-for-4 with the grand slam and hos fourth stolen base (in as many attempts). The RockHounds, after committing two errors Tuesday, were errorless again in the series finale. Tuesday's miscues were the ONLY errors the club committed on the road trip. Luis Barrera (right shoulder) was out of the lineup again Wednesday. Luis is 9-for-21 (.429) through the season's first five games, with two triples, a home run and four runs batted in.